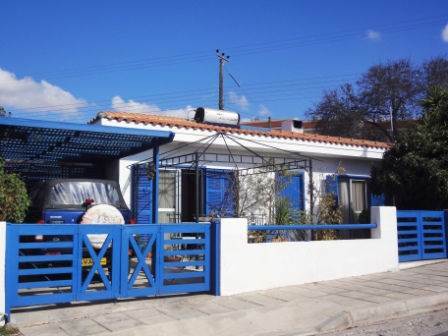 Tala, Paphos - This charming 2 bedroom bungalow is situated on a corner plot in the popular village of Tala. The quaint village square with it’s restaurants, tavernas and coffee shops, is within easy walking distance, as is a good variety of local village shops. What makes this bungalow extra special is it’s wonderful character and cottage like feel. The open plan living area is nicely divided into distinct areas; a comfortable lounge with feature fireplace and fitted wood burner - great for those chilly evenings in the winter; a corner galley style kitchen and a dining/study area. Patio doors lead onto a front paved terrace and garden area. Off the lounge is a hallway with built-in shelving, leading to two double size bedrooms, including fitted wardrobes, and a family size bathroom. The rear garden is idyllic with it’s huge covered terrace with archways onto the swimming pool terrace - a fabulous setting for outdoor dining and entertaining. The garden is mature, full of colour. and very private, due to the established fir hedges and the use of trellising. There is plenty of extra storage with a large shed and dovecot, which houses an additional 600 litre water tank. Being on a corner plot, the property has two driveways, one either side of the property. As the current owners use only the one, the second is utilised as an extended garden area. The trellising on the front driveway can be levered open to provide further parking . This property is suitable for residential living or as a holiday home, and has full title deeds. Please refer to MLS #: 1154 when inquiring.